"candace be the last knock knock joke?" Keep that one in your back pocket, parents, you're going to need it. Jokes and riddles aren't just fun for kids, though. They are great for language development and reading comprehension. In fact, in this article from Reading Rockets, they describe a study where kids who were exposed to riddles and books with ambiguous words (such as homonyms) showed a significant growth in comprehension levels. Jokelepedia: The Biggest, Best, Silliest, Dumbest Joke Book Ever, by Ilana Weitzman- everyone needs a jokelepedia. Tons of jokes at ready reference. Spongebob Joke Books- I found this book at a yard sale. There are several Spongebob joke books to choose from. The jokes are lame but kids don't care. If you see a joke book featuring a favorite character, pick it up, it's sure to be well loved. Knock Knock Who's There: My First Book of Knock Knock Jokes by Tad Hill As I mentioned before, my kid loves knock knock jokes. This is a great book of knock knocks for the youngest readers. You may remember author illustrator, Tad Hill from "?? Rocket Learned to Read." These illustrated knock knocks follow the same cute illustrations. 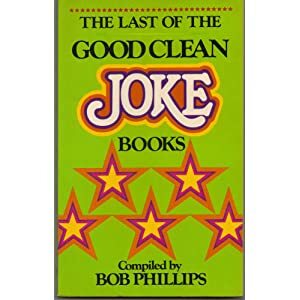 The last of the good clean joke books by Bob Phillips. Ok, this was my favorite joke book when I was a kid. My aunt gave it to me one Christmas in a boxed set. It is still lingering around my parent's house. Sadly, (or gladly) it wasn't the last of the good clean joke books as promised. In fact, Bob Phillips has many joke books for kids and even one published in 2012. If I had known it wasn't going to be the last one, maybe I wouldn't have clung to it so dearly my whole life... way to lead me on, Bob! Here's his 2012 release, Zany and Brainy Good Clean Jokes for Kids. Grin and Bear It by Leo Landry This is a story of a bear who wants to be a comedian but suffers from stage fright. As the story unfolds, readers are entertained by the bear's jokes. The King Who Rained. I loved using this picture book focused on multiple meaning words when I was teaching fourth and fifth grades.As you can tell by the cover, the story is based on the imagination of a little girl who imagines the incorrect meaning of multiple meaning words. My students would often write our their version of the bookafter reading it. Amelia Bedilia books are also an excellent resource of teaching words with multiple meanings. In fact, these books were used in the study that was mentioned at the beginning of the post. Once your child has read riddles and jokes, let them try making their own joke book or write riddles. 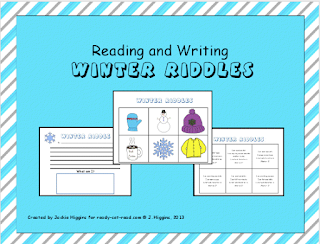 I recently created these winter riddles for my boys to read. I also created a sheet for writers to record some of their own riddles. If your child is young like mine, you could write the words for them and allow them to draw a picture. You can get this free in my Teachers Pay Teacher Store. I'd love if you'd follow my store while you are there for additional freebies. I hope these jokes and riddles bring a little joy to your January! Remember, while your kids are laughing heartily at these jokes-- and you are rolling your eyes-- their comprehension level of text is growing by leaps and bounds! Jokes and riddles - what a great way to start out the new year! Thanks for sharing with us readers.